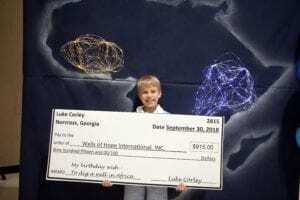 Luke Corley presents a check for $915 to Wells of Hope International representing donations given to make his birthday wish come true —clean water for children in Africa. Congratulations and Thank you, Luke! 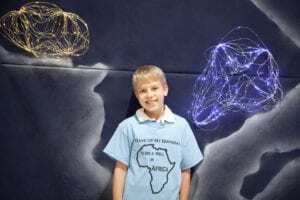 Below Luke is wearing t-shirt gift from Wells of Hope International “I gave up my birthday to dig a well in Africa.” Luke’s birthday fundraiser will build two wells giving children health and hope for their future. Use your birthday to make a difference for the life of others. Have a party and celebrate your birthday. Ask your friends and family to donate to Wells of Hope International in honor of your birthday instead of buying gifts for you. Use the celebration of your life to give the gift of clean water to others. You and your friends who make donations will receive the location of the water project you funded with a picture of the village around their new well. Donations can be made in your honor using the form below or mail a check to Wells of Hope International, 863 Flat Shoals Road, SE, Suite C #344, Conyers, Georgia 30094. When filling out the form using your computer, press “tab” to advance from one form field to the next. If on your phone, click into the next form field with your finger once you complete the one you are working on. A receipt for your tax deductible donation will be mailed to the address provided above.